With the beginning of the new year behind us, it's time for another new beginning: Your webcomic. Maybe you've always wanted to do one, or have an idea for one, or even tried getting into the print industry but found it to be difficult and subjective. Or maybe you just want to have a bit of fun, who knows. However, there are a few things that will make your webcomic easier to start and maintain. We've all heard the "build a buffer," advice, and its good advice, so I'll mention it later, but there's a lot more to preplanning than just "doing it." Here are the steps I would take if starting a new comic. I start new comics all the time, as my website is mostly short stories. I work mostly in dramatic comics, but I will bring each step into the comedic strip realm as well. I made a female character named Queens. I liked how I drew her and wanted to put her in a story. To do that, I built the story around her job, which I decided was a bartender. The other characters quickly came into play: customers, co-workers, and friends. The setting was the bar, of course. The theme turned out to be the least driving force of the comic, but it played a role in the story. I wanted to tell a sci-fi story, so I began with that. I created the setting and story first, taking place on Earth, and then Mars later in the story. But I had to figure out how to get there, and I decided to make it a kidnapping/rescue story. My players came after I decided the story, adding the kidnappers, the character in trouble, and the rescuer. The theme once again came last, and didn't have much in the way of driving the story, but once again, it still was there. Love/Toy (NSFW) was a comic I had wanted to do because of the theme. The difference between healthy and unhealthy relationships, an exploration of heterosexual and homosexual relationships, and a coming-of-age story about someone discovering this new phase of her life. To pull this off, I needed characters and a story, so I wrote the story next: A girl attempts suicide, and ends up rescued by an older woman who is not sure of her own feelings and current relationship. After this, I worked in the characters, and their own stories were used to build the larger theme. Now, for comedy, you are rarely using a Theme Driven story. Most are Character Driven, like Penny Arcade, PVP, Evil Inc., etc. Certain people have personalities that play off of each other. Some are Story Driven, like Menage a 3 (NSFW), The Cow, and Bardsworth. My current story is very much a "What If" scenario that is Story Driven: A punk band survives the zombie apocalypse. Now that I have the characters and story, the jokes follow. Whether they are about music, being in a band, or fighting zombies, I can pull from every aspect of it to make jokes. Character Driven comedy is your basic comic strip: The jokes are made about the characters' interactions. Garfield likes lasagna and kicks Odie. Story Driven comedy is a little trickier, because you can't just pull any old joke out for the next day. Sometimes you don't have a joke in a Story Driven comic strip, especially if you wanted a dramatic moment with the characters. This way of thinking about comics is very limited, but it gives you an idea of where to start your thought process. Start from one piece of the puzzle, and work from that. Don't make everything up all at once, especially because later on, you might have something that you want to work in. Without seeming like I'm banking off of the mention for my comic (which I'm grateful for, by the way), I think it's interesting you labeled it as a story-driven one. I've always seen is as being character-driven. But maybe that's just due to my particular method of writing, which is to let the characters decide what happens. It's funny how you can perceive your work one way while a reader may perceive it another. Yeah, I would also of stuck Bardsworth in the Character Driven category. Sure, it does have a story, but most strips deal with the characters and how they relate. I would also call Penny Arcade theme driven, because the theme is almost always video games and technology (let's discount things like Catsby and Twisp, and the Cardboard Tube Ninja) and more importantly, I don't have to know the characters of the yellow guy and the blue guy to find any one strip amusing. A very interesting breakdown - I'd never thought of such things before! Matt I would disagree on the Penny Arcade thing. 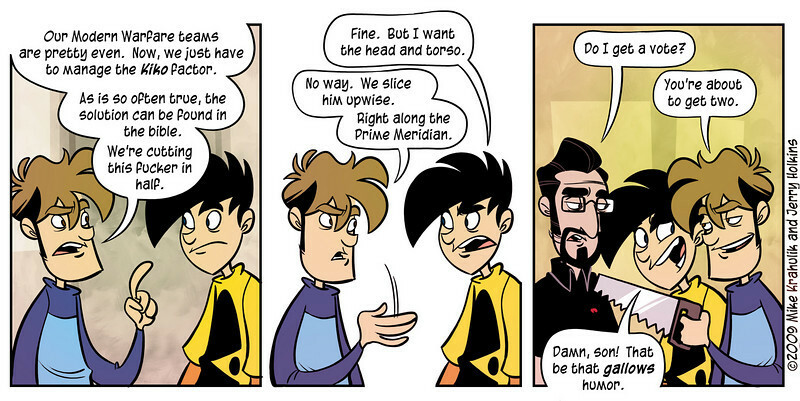 I don't know Bardsworth well enough to speak to that, but for me Penny Arcade is all about Tycho and Gabe. Sure the comic is about video games and so you are right about it being a theme comic but my personal feeling is that it is very character driven. I can tell you just about anything you want to know about how either character behaves or will react to certain things. For me the best Penny Arcade strips are the ones where Tycho flexes his intellect and Gabe shows what a drooling idiot he can be. The way Gabe dreams of Spiderman at night or the way Tycho goes on and on about whatever has set him off. 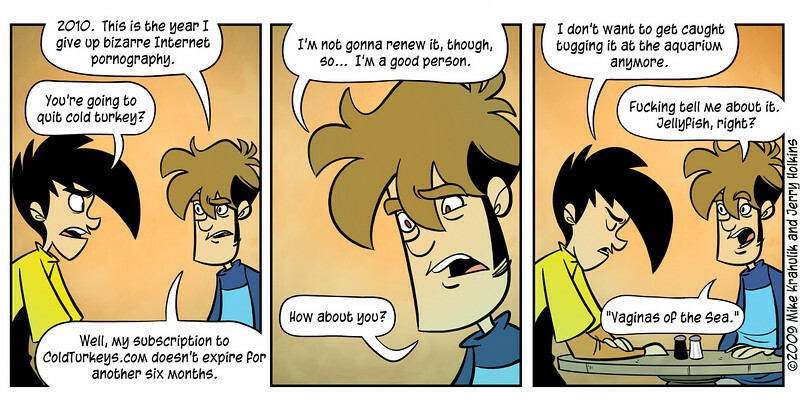 I don't read PA because I want to know specifically how Jerry Holkins and Mike Krahulik react to a game. That's what the blog is for as far as I'm concerned. I read the PA comics because I want to see what Gabe and Tycho are going to do next; how they are going to react to a new game. I read the PA comics because I want to see what Gabe and Tycho are going to do next; how they are going to react to a new game. This, quite frankly, is one-dimensional. If you are returning every Monday, Wednesday, and Friday specifically for this purpose, the comic is not character-driven. Characters are three-dimensional, fully fleshed out people with believable needs, wants, desires, and goals. For example, Peanuts was character-driven. We were all interested is seeing how Lucy was going to trick Charlie Brown into trying to kick the football, but there was much more to their characters than that reoccurring gag. We read Peanuts because Schultz gave us a good assortment of characters, each with a different voice, who worked together to make us laugh (and sometimes, excuse the cliche, to touch our souls). Sure but there is far more than just Gabe and Tycho to the strip as well. New characters, often related to the games or news items they are referencing are often on hand. Also there are their wives, Tycho's niece, Div, The Merch, Kiko, fruit fucker, and probably others I'm forgetting. All fairly recent and all extremely character driven. That last one doesn't even have anything to do with video games and the first two involve real characters and real situations that have come up in Mike and Jerry's lives that have been transferred and of course forever changed by the transfer to the world of Gabe and Tycho. This isn't Lucy holding a football time and time again. There is way more going on here. And I remain convinced that while PA has a theme the characters (and story to a lesser extent as there is some small amount of what they call "dreaded continuity" and the characters do grow and change slightly over time) are what make the comic. This, quite frankly, is one-dimensional. If you are returning every Monday, Wednesday, and Friday specifically for this purpose, the comic is not character-driven. I'd agree. That's more of a gimmick/theme driven concept. The issue, though, is that for every person who just wants to see them review, parody and poke fun at games is someone else who is interested in the personalities of the characters and how they interact with each other, as opposed to the game of the day. It's objective because different people will always get different things out of the same comic--it might be one dimensional, but that doesn't make it any less valid. At the same time, its validity doesn't discredit the idea that to some, it is a character-driven comic. My head hurts after I just reread that. As an aside, it's cool if people writing articles plug their own comics and all, but should there be a line when too much is too much? Tossing a link out there is one thing, but if you need to add a link to one of your own projects to validate every point you make, it just seems like a bit too much. It wasn't so bad in this article, because a lot of links to other comics were made, but at the same time, I felt is detracted from the potential information the article could have conveyed without them. It seems like articles for this website could very easily be abused if there's no limit, you know? No disrespect to Trevor or anything, but this is something that I wanted to point out now, before it actually becomes an issue, and before people who haven't submitted articles read Trevor's and think 'hey, if i write an article, I can link to my comics/specific pages of my comic and get a pile of free advertizing!' and do just that. Well actually... they can. I mean, my position is that as long as the article contains information useful to webcomickers and spurs discourse it's good enough to post. The fonts are free here in the digital domain and I don't mind if they get used. There are always more. Also, two things to keep in mind. The site is now 4 days old. It might take some time for the really really good articles to start coming in. And even then, some will be better than others. So right now I'm grateful for whatever we get. I've got some feelers out for some articles that I think may really wow. But once again... 4 days. And I've been pretty busy... and other than Trevor I've had no one else to volunteer to help out as a moderator. So I'm doing my best here. And this may be very useful for some newbies. We have some folks here who are literally days into their first webcomic and a couple who are still thinking about their first. Lastly, some folks can write better than others. I'll do what I can to keep things neat and edited and on target (Trevors post needed no editing I'm just saying) but I'm not going to tell someone I won't post their article simply because they have to reference what experience they have with their own comic to make their point. I minored in English along with my two law enforcement degrees so I do understand what you are saying and if I get a bunch of self serving tripe in my in box I won't waste anyone's time putting it up. But I think Trevor's post has merit and provides info and that's what we're here for. I also think that while his premise is structural and therefore a recommended course of action his examples are open to interpretation by the individual which is why we are seeing some disagreement. I like that. But just because his examples are open to interpretation doesn't mean his advice is flawed. And this is only part one! Although I don't think it will be a serious problem you can consider the alarm raised. @Rob - I'm still not convinced that Gabe and Tycho are characters in traditional writing definition of characters. I've been reading PA for years, but I couldn't tell you much about either one of them outside of A.) they like video games, B.) they are violent, and C.) they are married. There is nothing within that list that is ever really expanded upon. And can you answer these questions: What are Tycho and Gabe's goals? What are they doing to achieve those goals? How do they react to failure on the road to achieving those goals? I'm not trying to turn PA into a Dickens novel or anything, I'm just illustrating a point. Existence alone does not make a character. The character must be believable, even in a world where Fruit Fuckers exist and where you can just up and kill someone without consequences. I can't view Tycho or Gabe as believable characters, and I honestly don't think that's what Jerry and Mike are going for anyway. They write mostly for gags, that's all. @ran - I see where you're coming from, but one of the core rules of writing is writing from experience. In this case, Trevor outlined his experiences in writing different forms of comics. He wasn't trying to plug himself or anything, and I think most people will get that. Oh no, I absolutely understand--Trevor's article is useful, certainly. I just feel like, if your goal is to teach and inform others and you're talking about a visual medium like webcomics, your experience is critical, but, you need to take that experience and think about how it applies to your audience. Heck, that might even mean that, instead of linking your whole comic and saying 'this is an example', you might want to consider posting specific examples from your own comic, images included. It works both ways. I've had bad convention experiences with other comic creators before--I spoke on a 'How to Run your own Webcomic' panel once. I was told, last minute, who was on the panel with me and they were two unrelated authors whose work I was unfamiliar with. Each of them had their own panels about their own specific works later on, but for some reason they mentally decided that this panel was an extension of their own and made a point of talking about specific pages and story arcs and their own lives when it was fairly clear that most of the audience had nooo idea what they were referring to. It didn't help that they had a group of friends in the audience who seemed to be there to only ask them specific questions about their comics. The panel moderator was super stressed, and the audience seemed kind of bored. I do not believe that they learned or picked up as much as they could have if the speakers had focused on the topic, which was helping the audience out, instead of enacting some sort of shameless self-promo agenda. This is not a convention panel, and so I understand that the rules are different, but at the same time, keep an eye out. You can already see that the creator of Bardsworth chimed in and thought of his comic differently than my own thoughts (more on that later). However, I know my own stories, my own plan for them, and how I wrote them. I need examples, and rather than using other plots that I may not know as well, I'll use mine to explain where I started. You don't have to click on the links, but they are there just in case you wanted to see what became of the initial starting plan. The other thing worth mentioning is that this is very diagrammatic thinking. Not all stories can be classified as only one of the points I listed. Story arcs in Character Driven stories are perfectly fine, and one off gags in Character Driven stories are too. However, I was writing to give a brief overview of places to start your comic, things I have done and that I know work. In the future parts, I will probably be referring to my characters, my stories, and my thoughts, only because it's what I'm capable of talking about in depth, without screwing everything up. Also, since I'm talking about story as a whole, it would be silly to take one page from one of my comics to stand in for the whole story, especially when those stories are short in length (Regulars is 30 pages.). Read to the end of the post, I'll give some "non-me" examples. Pete: The reason I see your comic as Story Driven is because your jokes are largely dictated by the story, especially in the beginning. That's not saying that the characters have no value, far from it. 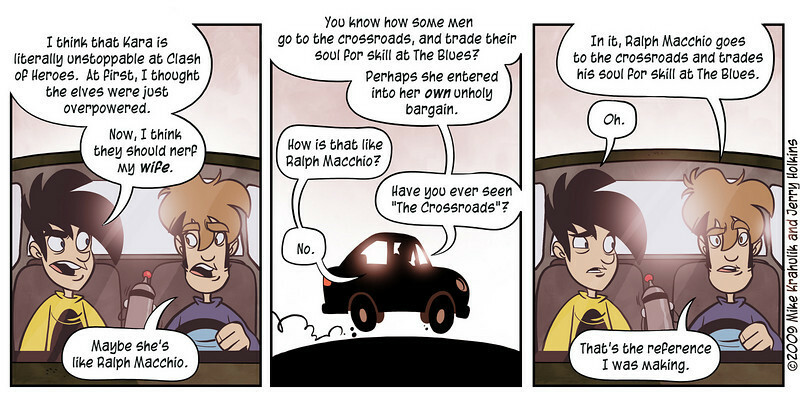 Penny Arcade is very Character Driven as there is little or no story to speak of. Matt: I think of Theme Driven as a different animal altogether. Most stories do have a theme, but theme driven stories can be character or story driven in the background. What is important in a theme driven story is what would be considered the "lesson." The best examples of Theme Driven works are two Star Trek episodes. "Let That Be Your Last Battlefield" (TOS), and "Measure of a Man" (TNG). The theme is inherent in every decision the writer has made, and the story serves to push that theme. Specific lines of the dialogue brings that theme to the characters, perhaps even discussing the theme in full. The characters are important to the story, especially in "Measure of a Man," because of the continuity built up for Data. A Story Driven work would be more like "Cause and Effect" (TNG), where the story is repeated over and over, until slight changes within it drive the episode. Eventually, the story circles around a few characters, but their entire motivation is those small story clues that build to the final climax. Character Driven plots within Star Trek are numerous. Just look for most Q episodes, and those actually named after characters (Data's Day, Menage a Troi, Mudd's Women, etc). Not once did I imply that you needed to justify anything. In fact, if I was an editor for this website, I might have taken the article and asked you to expand on your own examples--instead of just dropping a general link to the whole comic, I really feel like beginners might have learned more from this article if you had gone and found specific strips or pages from your example comics that really illustrated the differences between the three, making it easier for those trying to find their own bearings in the webcomic world to identify the type of comic they're likely to feel the most comfortable with. Perhaps some pros and cons in terms of marketing each type for each would have been cool, too. Like I said, it's all about taking all of your own personal experience and really, really making it relevant and helpful to the audience your article is aimed at. Like I said, it's very difficult to do that when it comes to story. A story is built up over time, so one page wouldn't have enough description. As for marketing, I'll get into that in a later part. These aren't three different stories per se, they are three different ways of starting a story. I don't say that a Character Driven comic can't have a theme, or that a Story Driven comic can't focus on character interaction. What I am saying is that you can start with one, and build on it. It's a tool I use for when I have to start something new. That's pretty binary thinking there, friend: It's not X so it must be Y. I can't buy that, for that all of the reasons that I listed before. To be character driven, you have to have characters. Drawings with names are not characters. Drawings with names who are believable are. It may not be theme driven, but it's not character driven, either. I'd say it's gag-driven.